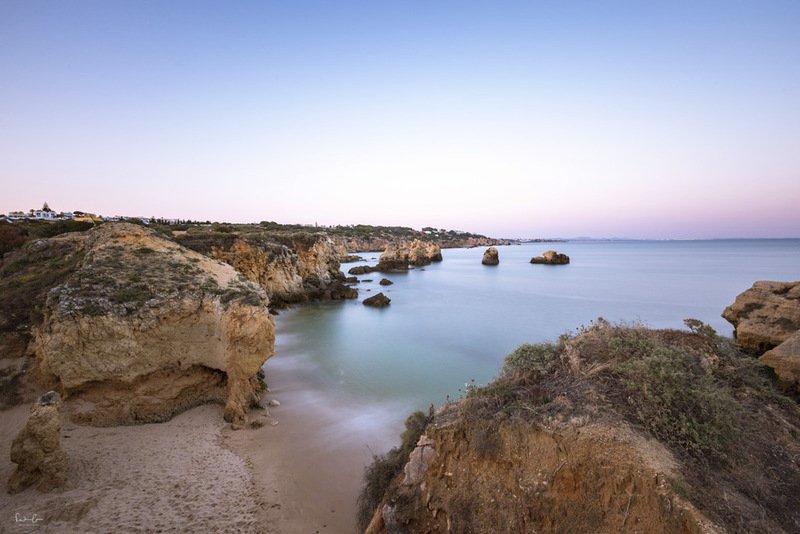 The Algarve is an amazing area for seascape photography. A perfect ensemble of the sea with its rock formations. The views on some spots are breathtaking so that I could spend hours and hours at one single place. 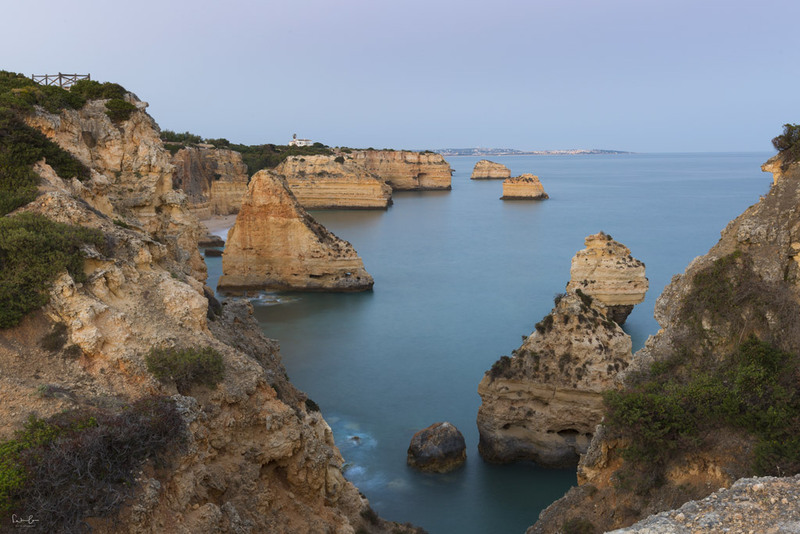 Are you looking for the best Algarve photo locations? 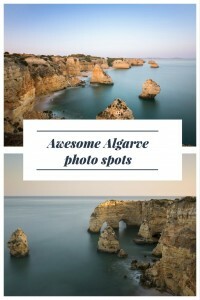 In this article, I’m sharing with you my favorite Algarve photo spots, how to get there and how I captured the photographs. For these shots, you should definitely bring a tripod to do some long exposure photos. The sea looks calm and kind of mystic when its captured with long shutter speed. If you have one, bring an ND (neutral density) filter, which reduces the amount of light passing through the lens. You can do super-long exposures with an ND filter. I will explain the different filters for photography in a separate post. You can take great photos without a tripod even after sunset. However, you need to increase the ISO and that means noise (check out my blog post on simple tips to improve your travel photos). Travel tripods of good quality don’t have to be expensive and heavy. It is a great investment I’d recommend you to take. It can be quite windy along the coastline. Hang your backpack on the hook of your tripod to stabilize it. I love ND filters and the effect they produce. I recommend having one in your camera bag. If you do super long exposures, cover the viewfinder with the eyepiece cover on your camera strap to avoid any light coming in. Make sure your lens and filter are clean. Remove dust and fingerprints before you go out shooting. Try different settings and don’t stick to the same aperture for all shots. Bring a headlight with you. Sometimes it gets dark really fast and you want to find your way back to the car, don’t you? Don’t forget to bring a windproof jacket with you. 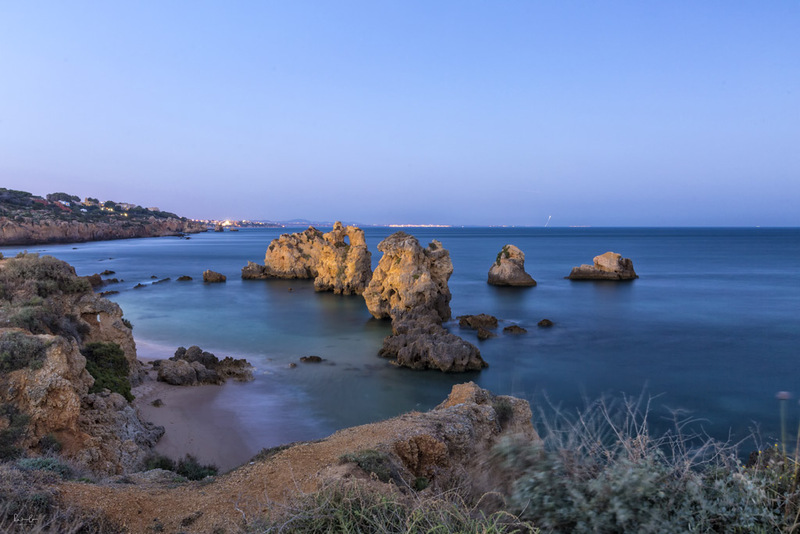 Albufeira used to be a small fishing village, while today it is one of the most popular holiday destinations with beautiful beaches and a lively nightlife. 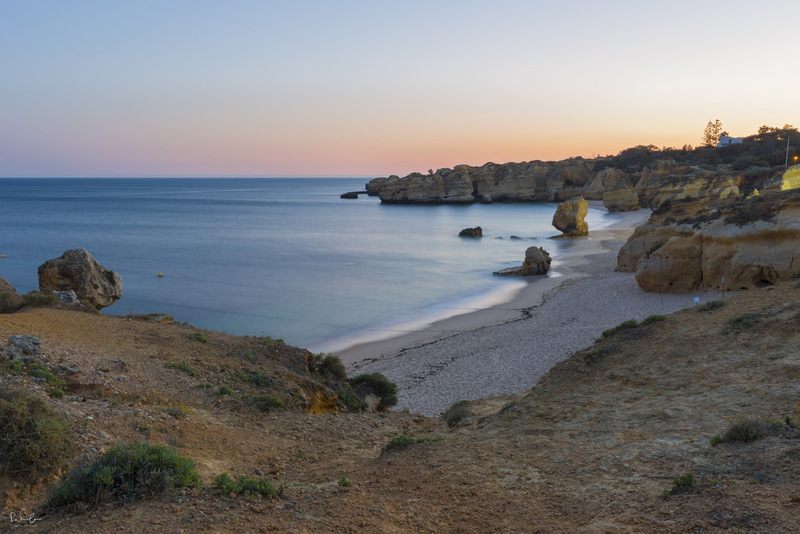 The photo location is between Praia de São Rafael and Praia da Vigia in Albufeira. There is a parking space (GPS location 37.076242, -8.279359) from where you need to walk a few minutes. From the rock, you have two directions which give both beautiful scenery. I shot the three images below right after sunset and used a tripod and partly an ND filter. You can find the settings I used under the photo. Shot with an aperture of f/11, 49 sec shutter speed, 27 mm focal length, ISO 100. The lights on the rock come from the restaurant at the beach. Shot with an aperture of f/14, 13 sec shutter speed, 23 mm focal length, ISO 100. 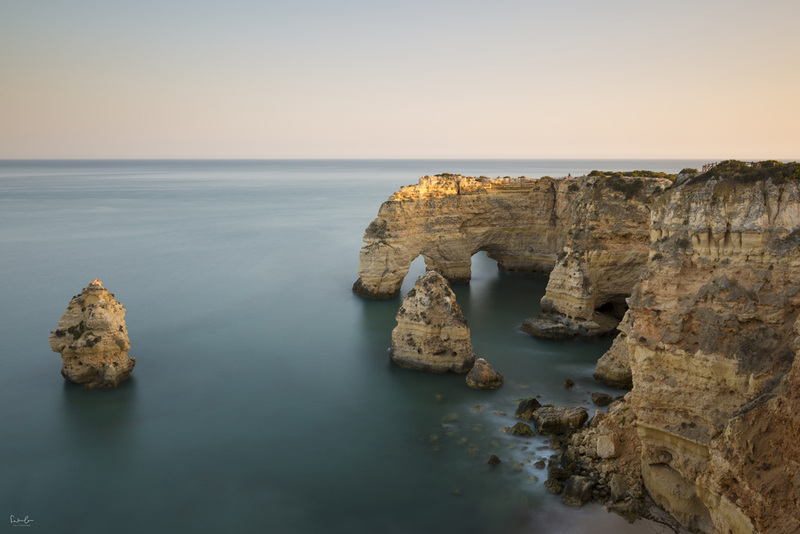 Located in Lagos, Ponte da Piedade is a group of rock formations along the coastline of Lagos. You can find many paths to take a walk along the coast or book a boat tour to discover the cliffs and coves. For my images, I’ve chosen to park the car next to restaurant O Camilo, where I had a marvelous late lunch/early dinner before I started to shoot. I definitely recommend this place for the food, their service and the sea view. Both images were shot during the day and you could easily forget the tripod. However, I usually use it to get even sharper landscape photos. Shot with an aperture of f/13, 1/125 sec shutter speed, 16mm focal length, ISO 250, with a tripod. 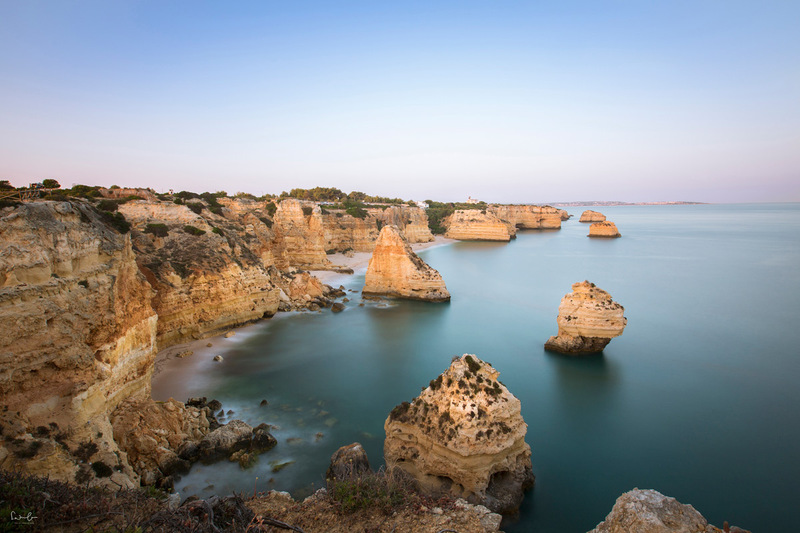 Located in Lagoa, a small provincial town, Praia da Marinha was the superstar of my seascape photo locations. There is some parking (gps 37.090276, -8.412619) from where you walk along a coastline trail towards the Arco Natural Algarve, a natural bridge. I stopped a few times to find places to shoot and you will see there are quite a few. Plan to be there at least two hours because the place is just amazing and you probably don’t get enough. Shot with an aperture of f/11, exposure time (= shutter speed) 45 sec, focal length 25 mm, ISO 100, ND filter with 3 (10 stops). View on the Arco Natural Algarve. Shot with an aperture of f/14, shutter speed at 8 sec, focal length 31 mm, ISO 100. Shot with an aperture of f/10, shutter speed 68 sec, focal length 17 mm, ISO 160. One of my favorite shots from my Algarve trip. The famous Benagil Caves are located close to Praia de Marinha. Check out this guide to visiting the caves for a great experience. When in Portugal, you should not miss the capital, Lisbon. I’ve got the Top 10 things to do for you. 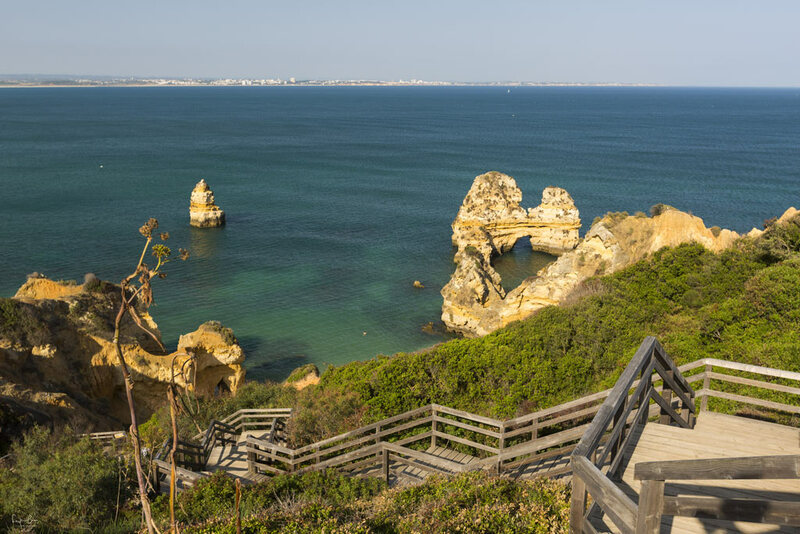 Don’t miss to read this Algarve itinerary and check what else to see on the coast of Portugal. Thank you very much. I hope you can go there soon. It’s really beautiful. The landscape is amazing and the people are very nice. If you need any tips, let me know. I’m happy to help. I am currently in tne Algarve, based in Carvoeiro. 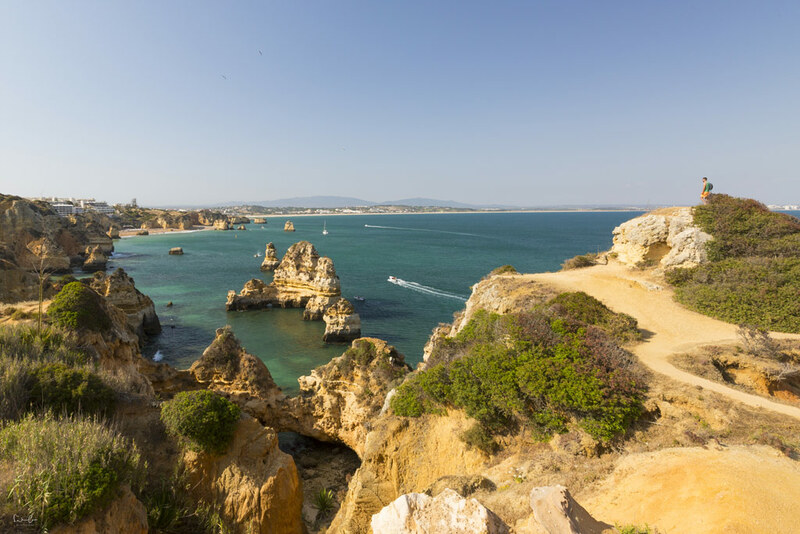 The coastline in the immediate area (Lago and Carvoeiro) is stunning. That’s great. Have fun and thanks for your comment. I’ll check it out next time. I’m planning to visit Portugal in October to take some shots, how long does it take to visit these sea side locations,I’m going to rent a car so how many days do i need ? Any other recommendations would be appreciated . Thanks for the great location tips. We stopped at Albuferia and Lagos today and I was able to get some great shots with your tips. Oh great. I’m glad you found them useful!